The Nippersink Creek, a twenty-three-mile long creek with a 138 square mile watershed, is a major tributary of the Fox River and a safe stream for paddlers of all abilities. Paddling the Nippersink is among the best ways to experience the landscapes of Hackmatack National Wildlife Refuge, and the Nippersink watershed is a major focus for Openlands in our ongoing restoration at the refuge. 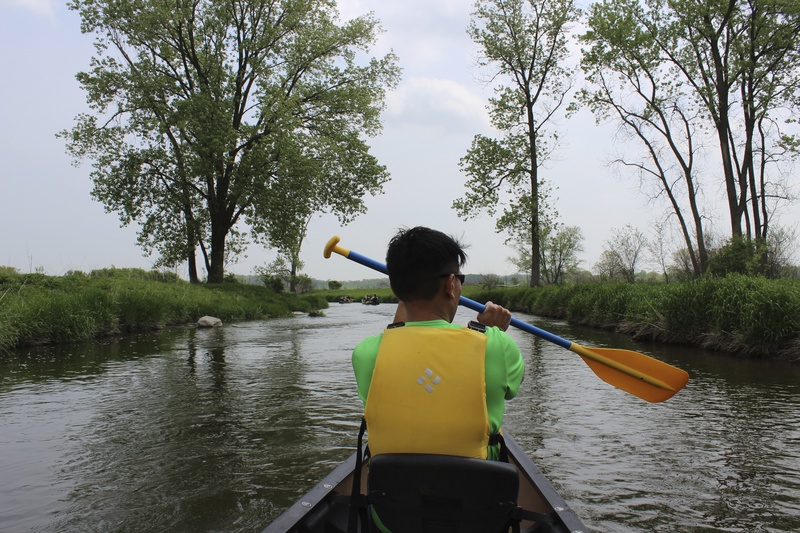 The McHenry County Conservation District provides a water trail on the creek that can serve as a model for the region. Access and facilities are excellent from Keystone Landing below Wonder Lake to the Nippersink Canoe Base near the Fox River Chain O’Lakes and Route 12. Rest stops and picnic areas are carefully thought out, and there is little sign of trampling or misuse. The McHenry County Conservation District recommends the following local outfitters for rentals: Ed’s Rental, McHenry, (815) 385-3232 (canoes & kayaks); Tip-A-Canoe, Burlington WI (262) 342-1012 (canoes & kayaks); Main St. Outfitters, Wauconda, (847) 526-7433 (kayaks only); or Scull and Oars, Wonder Lake, (815) 790-4249. Directions: Keystone Landing in Glacial Park, owned by the McHenry County Conservation District, is located east of the intersection of Keystone Road and Barnard Mill Road, in Wonder Lake. The canoe launch, also owned by the conservation district, is located northeast of Route 12, south of Sunset Drive, in Fox Lake. In between, there are canoe launches located west of Pioneer Road and north of Harts Road, in Solon Mills; and in Lyle Thomas Park, approximately 0.2 miles north of Route 12, on Blivin Road, in Spring Grove. Notes: The creek meanders through conservation areas and farms, affording views of glacial landforms characteristic of Hackmatack National Wildlife Refuge. In Glacial Park, the conservation district has completed one of the largest stream restoration projects in the country, enhancing aquatic habitats and protecting water quality, which is considered some of the best in the region. Please respect the privacy of riparian landowners—no landing on private property. Always check United States Geological Survey (USGS) water data before your trip. Glacial Park encompasses 3,400 acres of restored open space including prairie, wetlands, oak savanna, and delta kames. Over 400 of these acres are a dedicated nature preserve, and it is home to 40 state-endangered and threatened plant and animal species. Additionally, Glacial Park is ranked as one of the top five locations in the region to view migratory birds. Visitors can enjoy a wide range of activities from horseback riding to hiking to historic site visits. Currently, Glacial Park is the best way to experience Hackmatack National Wildlife Refuge. Hackmatack was designated as a refuge by U.S. Fish and Wildlife Service in 2012 and will span over 11,200 acres once complete. Hackmatack will be built around existing conservation lands such as Glacial Park. This park is a prime example of the habitat and wildlife Hackmatack aims to protect. To learn more about Hackmatack, please visit www.openlands.org. Pioneer Road Landing is closed except for hunters with a key code to open the gate. Submitted October 30, 2018.